Please get in touch with David for a custom quote and we'll get back to you within 24h. For a complete list of the features we offer, reach out to David via the Application button. Our Conference Room is your ideal retro cinema. 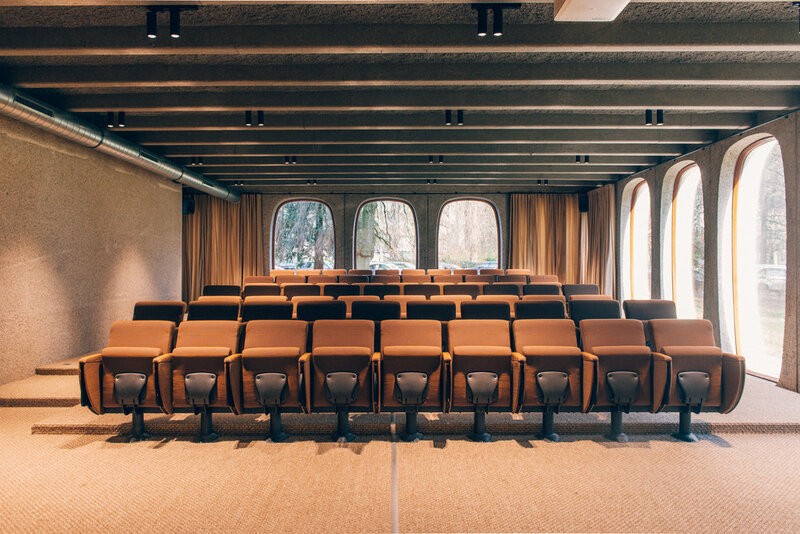 Filled with light for presentations or cosy dimmed for video screenings. This room can be rented together with our Lobby at a discount rate. We named this room after the huge oval table in the middle. Very inventive, isn’t it? Right next to our Lobby, this spacious meeting room can fit 12 people. Catering & other services on request. This spacious meeting room does not only come with a grand round table, but also a serene living room area to take a step back and think things through. Equipped with a flipchart & Samsung Frame. Catering & other services available on request. Perry’s Room is named after the work hanging proudly on our wall from Perry Roberts. 8 people can sit comfortably in this bright room on our ground floor. Equipped with a whiteboard and Samsung Frame. Catering & other services on request. In some of our meeting rooms, you can find beautiful marble tables. They were specifically designed for this space, fabricated with marble waste. These tables can sit 8 people. Equipped with whiteboard & Samsung Frame. Catering & other services available on request. Jules Wabbes collaborated with architect Brodzki to make this building into a concrete masterpiece. As a tribute to this great designer, we named a meeting room after him. Very similar to Perry’s Room, this space occupies 8 people. Equipped with whiteboard & Samsung Frame. Catering & other services available on request. Apart from being an enjoyable meeting toom, our Tailor Room also serves as a fitting room for our in-house tailor Café Costume. Did you know the wallpaper is a replica of the inner lining of one of their suits? Catering & other services available on request. Ideal for workshops & presentations. High up in the sky, our Class Room is not your ordinary training centre. Equipped with flipchart & Samsung Frame. Catering & other services available on request. Our smallest meeting room, on the 8th floor. Named after the beautiful chairs, by Tobias Scarpa. Equipped with whiteboard & Samsung Frame. Catering & other services available on request. Our penthouse room, on the 8th floor. Carpet floor and a one of a kind table, what do you want more? Equipped with whiteboard & Samsung Q6 Smart TV. Catering & other services are available on request. Our Bar Moroder at the 8th floor serves as an office by day and a rooftop bar by night. Equipped with speakers & microphone for a presentation or speech, or even some music to get those hips moving.